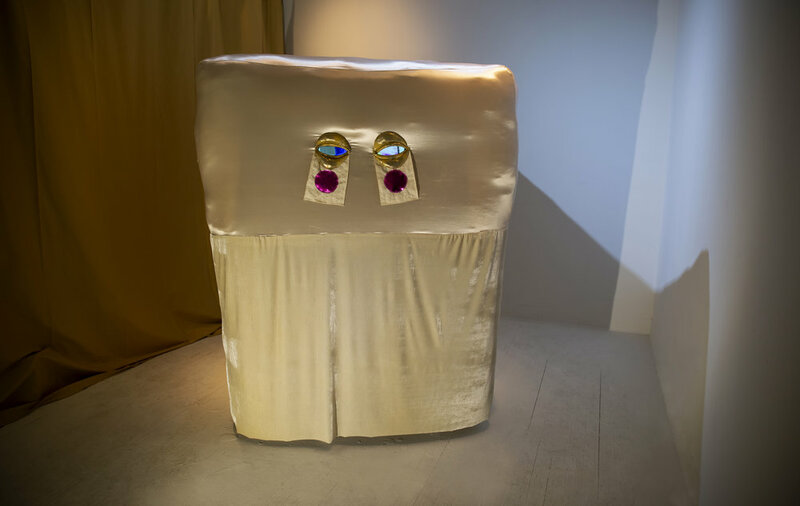 In my two channel video, Gold/Milk/Dresser/Lampshade (2019), I fabricated wearable sculptures that resemble pieces of furniture: a dresser, a lampshade, and a television. The dresser is worn on the the torso of a performer, and has moveable drawers that hold keys of various sizes with corresponding locks. The lampshade fits over the head and rests on the shoulders of a second performer, creating a mask effect. Lastly, a slipcover goes over a television, which sits on the lap of a third seated performer. These sculptural forms are activated through the performers who wear them, and give life to these objects with unique personalities. These objects become characters that personify a different personality trait: The Dresser is bold and in control, The Lamp is curious yet timid, and The Television is removed and apathetic. I break down a layered identity into individualized parts, assigning each of these performers a section of a larger persona. The fourth character, “The Ideal,” is a masked individual who exists in an unattainable and parallel universe. They sit at a table drinking milk from a leaking cup, unembarrassed and self-assured despite their failure. The Dresser and the Lamp are drawn to this failed embodiment of idealism, while The Television apathetically offers it on their screen, like an advertisement. The individuals in this work are faced with absurd and tedious tasks that require an unbalanced level of labor and commitment in order to complete them. They use objects that fail when they are operated, such as a cup full of holes, locks without keyholes, and keys that bend and move when used. They willfully make situations harder for themselves, and endure circumstances when they don’t need to. These illogical scenarios speak on larger issues of the clumsy, nonsensical experience of selfhood, and what happens when the expectations of something that is supposed to happen goes awry. Not only do these performative characters embody different personalities, but they represent the nuances and complexities of themes surrounding ideas of the home, gender, and power. The video itself is presented as a diptych and is projected inside of a large, sculptural structure. The outer material of this sculpture is a shiny, pale pink spandex that has been stuffed to create a sensuously plush exterior. There are two eye holes on the front of this object that mimic the mask that is worn by The Ideal, which creates the look of an anthropomorphic bed or ottoman. 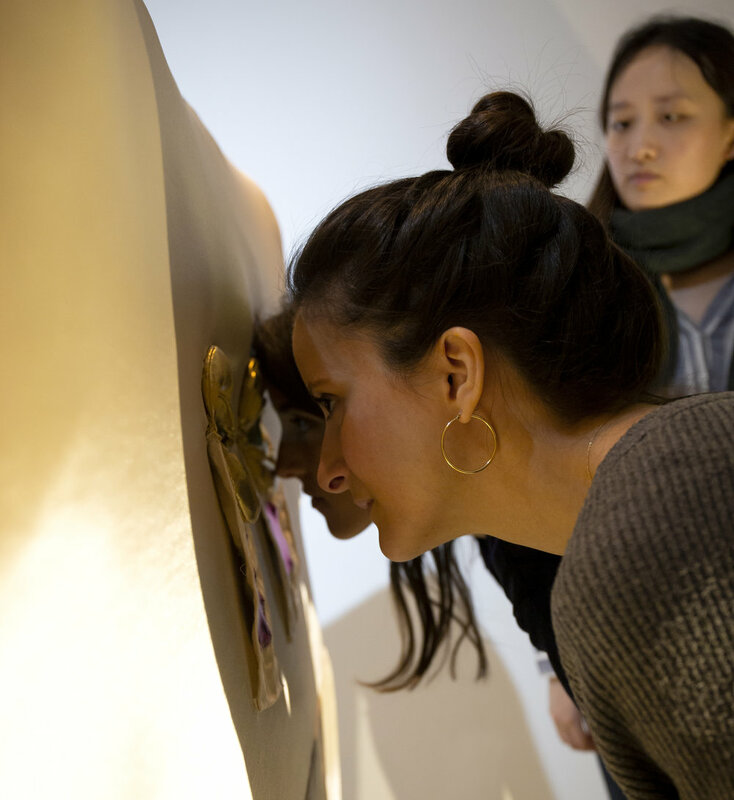 These eyes on the sculpture function as peep holes, and the viewer must crouch down and get close to the face in order to view the video inside. Just like The Dresser’s drawers, this way of viewing the work speaks on ideas of agency, and access. The Dresser’s drawers are only accessed by The Dresser themself, and they only allow The Lamp to access these drawers when encouraged. Only two viewers can access the video housed in the sculpture at any one time, and in order to do so, they must situate their face very close to someone else's. The characters in this work live in the mind of this sculpture, and the peep holes function as a window into their world. The viewer watches as The Dresser and The Lamp watch The Ideal on The Television; creating an inception effect that incites the difficulty of knowing whether or not something is real or a dream.